Let’s talk about this picture for a second. Is it tripping you out like it’s tripping me out? Do you see that green piece of parsley just chilling out in the bottom middle of your screen hanging on that pasta? Doesn’t it look like it’s totally superimposed in there and as if I just photoshopped it in? I swear I didn’t. It’s just the way it’s sitting. And I totally thought something was wrong with my screen and I kept scratching at my screen being like ‘GET OFF.’ Haha, I’m going crazy. But do you see what I see?! Okay, enough of my craziness, let’s talk about this pasta. So good. 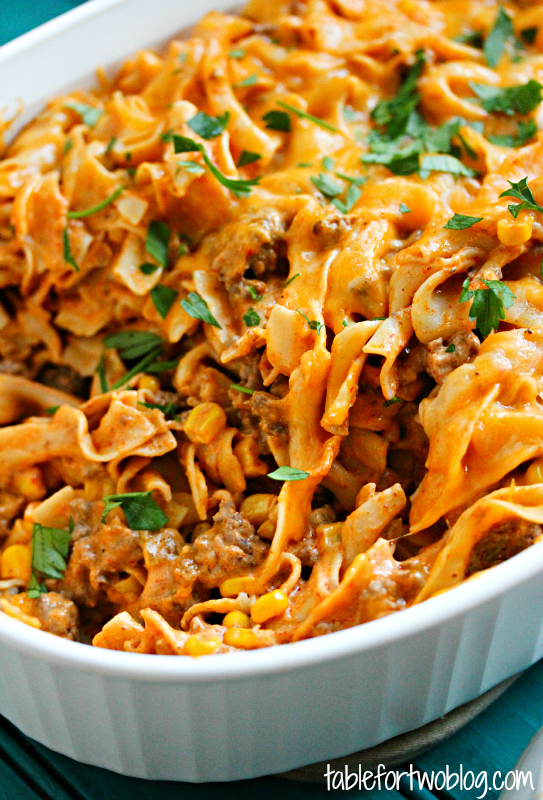 It’s like a deconstructed enchilada in a casserole. I love Mexican food and could eat it every day so having a bunch of leftovers was pure delight in our case. I believe we had two days of leftovers too. So yeah, if you’re looking for a large meal and leftovers, this is it my friends! Last night I went to Target and bought 3 pairs of colored skinny jeans. I probably won’t be able to fit in said skinny jeans after I eat 4 more bowls of this pasta and after my Seattle/PDX trip – oops. Okay so. Target. Let’s talk about how they have WHACK sizes. Like, I’m usually a size 4/5, 26/27, depending on how the sizing chart works and at Target I had to buy a size 11. I don’t get how it can differentiate so much. I mean, unless they’re designing a size 4 to be on a toddler’s body, then okay, but they clearly weren’t. Maybe they should get their sizing chart revamped. Just sayin’. 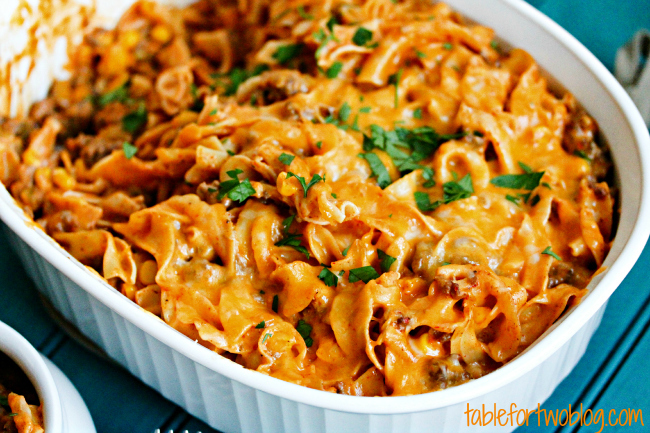 This enchilada pasta casserole is going to be a family favorite, for sure! In a large pot, bring water to boil and cook egg noodles according to package instructions. In the meantime, in a very large skillet, brown your ground beef then drain the fat. Then add the chili powder, cumin, and cayenne pepper. Stir to combine. Add in the cream cheese until melted and combined. In a large bowl, combine sour cream, enchilada sauce, half the cheddar cheese, half the monterey jack cheese, corn kernels, and diced green chiles. Stir to combine. In the meantime, drain your pasta. After you've drained it, add the pasta to the beef mixture. Make sure everything is coated in the sauce. In a large casserole dish, pour in the pasta mixture and top with the remaining cheese. Bake for 15 minutes or until cheese has completely melted. Serve hot. Keep in airtight container for up to 1 week. Yum! Made this for dinner tonight and it was so tasty! I made it exactly as written, except omitted the cayenne pepper as I’m also cooking for a 3-year-old. I thought it was perfect without the cayenne – great flavor with a little kick, but not overly spicy. Guess it depends on your preference on heat level. Everyone in the family loved it and it was so easy to put together, but tasted awesome! Thanks so much for sharing the recipe! Definitely a keeper! Very good recipe!!! I added onions to ground beef, and also a 1/2 cup mild salsa. Will be making again, for sure!!! If you scroll to the actual recipe, you can click the “print” icon and the recipe will pop up in another window where you can click “send to printer” and it’ll print just the recipe. Absolutely delicious. Didn’t change a thing. Thanks! I just made this for dinner. Although it was good…. I think two cans of Enchilada sauce would be better. Just not spicy enough with one can. Other than that my kids loved it. Tried this last night. It was sooo good! And very easy to make. I also made a version with beans in it which turned out really well. Thanks for the recipe! This was the BEST dish I have ever made! I swapped the ground beef for shredded chicken and it was absolutely awesome! I am definitely going to make this again! Made this tonight! Loved it! I was surprised by how much it made! Thank you, for sharing this recipe. This was great! My husband (who never likes to try new foods) loved it. He wants me to make it every week! Only thing I did different was used queso quesadilla cheese rather than Monterey jack just because I didn’t have any. 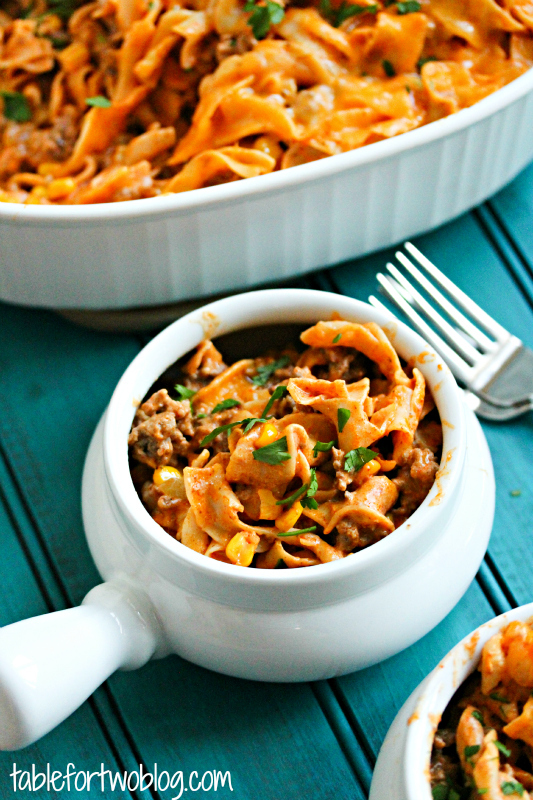 You don’t have to use egg noodles..you could always use penne or even rotini! I hope you try it! Haha, that piece of parsley always trips me out when I see that pic! Made this today, loved, loved it! Only change I will make next time, and there will be a next time, is to double the enchilada sauce. I will also add fresh cilantro, as someone else suggested, as my family loves it! I made this yesterday and despite a power outage from storms that prevented me from simmering the cheese mixture with the meat, it turned out deliciously after the power came back on for me to bake it. Like a clean hamburger helper with no chemical additives! Cheers. I’m glad your power came back on and that you were able to enjoy this dish! Hi there. I just had to write and say that this is scrumptious! My husband loved it too. I will be sharing this one. I hope it’s ok to do that and add a link to your site? 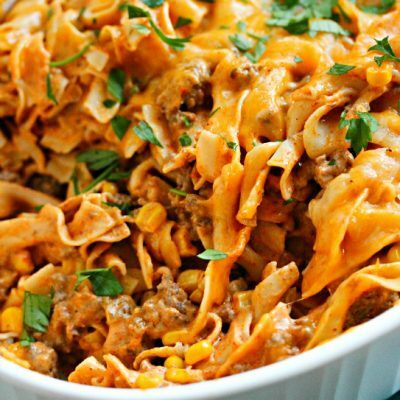 I’m gonna try this tonight for dinner, except I’m going to substitute the ground beef for shredded chicken. Cannot wait, I bet it’ll be absolutely yummy! Baked at 350F for about 30m. When I served it, we topped it with salsa. Holy Yum Indeed!! I’m so glad you enjoyed this with your modifications! Yummy! This is SUCH an incredible dish. I love enchiladas already, and this was a great way to mix it up. I can’t tell you how many times I’ve made this, it’s SO GOOD!! I like to add in some diced tomatoes as well. It’s my favorite dinner dish, for sure. So easy to make in bulk and easy to freeze! The sauce makes an awesome chip dip too. THANK YOU for posting this! I’ve made this several times. I substitute chicken for beef. My family LOVES it. My son requested it for his birthday dinner. If you haven’t tried it with chicken….do. It’s awesome!! I’m so glad your family loves this recipe and your son requested it for his birthday dinner! So awesome! Made this tonight sans the baking because too lazy to wait and I was hungry. Pretty tasty and love the creaminess of the cream cheese and sour cream. Thanks. Can you make this ahead, say in the a.m. but just not bake it until the afternoon? I saw that some froze the leftovers, but could it be frozen before baking? This was just okay, but in all fairness I did forget to add salt and pepper. My husband liked it though so I will probably try it again. I think I might add more sauce as another posted suggested. And maybe a little less noodles. I would think this would be an excellent freezer meal! I would combine everything and not bake it. 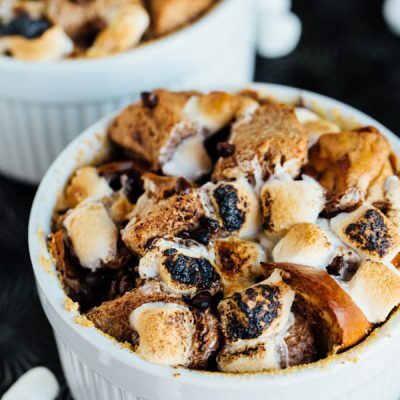 I personally would put it straight into the oven and just let it cook longer than normal, but be careful if you’re using a glass baking dish – you don’t want it to crack. So if you’re preparing this to freeze in a glass baking dish, i would thaw it before baking, but if you’re prepping this in one of those aluminum containers, then you’re fine going straight from freezer to oven. Just made this. It’s delicious. Had turkey so used that instead of hamburger. This sounds delicious and after reading the comments I will be making this tomorrow night for dinner. How side of size I use??? I’m not quite sure what you’re asking? I was reading your blog, but I didn’t raff the comments so forgive me if this is a little late. The reason you had to buy an 11 instead of 4 is because you bought ‘junior’ size jeans. I am also a size 4 but I’m a 9/11 in juniors. Thought I’d share. Food looks delicious! 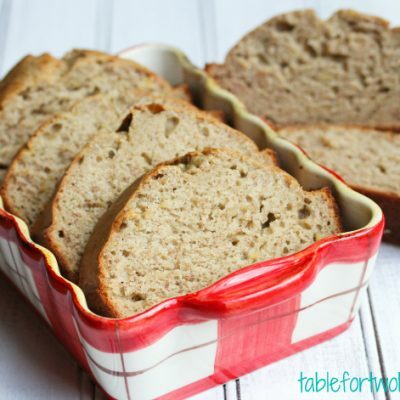 I am so glad I stumbled on this recipe! 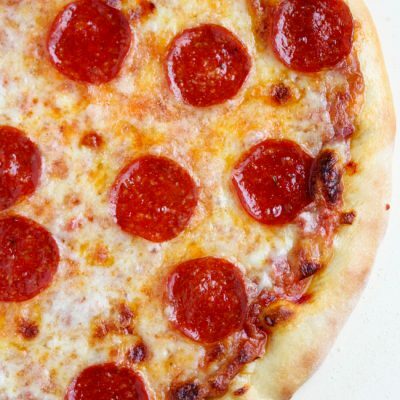 It’s easy, delicious and even better reheated for leftover nights! Thank you for sharing! I made this for dinner and it was a hit! I used black bean pasta (made only out of black beans), extra enchilada sauce, soy chorizo (from Trader Joes), and lots of garlic (because I can’t live without garlic!). It was so yummy, quick, and simple. This will replace the Mexican stuffed shell recipe I used to use. I really hate stuffing shells! This will be a regular dish in my house. Do you have to greasepan or dish prior? You can definitely do that if you prefer to! I didn’t grease mine. It is good, but way too rich for my taste. If I make it again, I’ll probably half the amount of cream cheese. I made this tonight after all the awesome reviews. I didn’t like it. At all. But honestly, I think it was the enchilada sauce I used. The Kroger by me was out of almost all their sauces, and I think the one I bought just wasn’t good. We are a family of 4, my youngest and I didn’t like it, my husband just thought it was ok, but my oldest liked it. I will try again with a different sauce, or make my own sauce.